In 2000, the compact trucks U300 / U400 / U500 with a GVW 7,5-16 tons have been presented. It could make hundreds types of work by a huge number of installed equipment. The same truck with different types of equipment can trim sides of roads, remove snow, clean streets, drill wells, lift loads, digging trenches, etc. There is even a version on a combined road-rail chassis to carry out shunting operations on the movement of rail cars on large enterprises and warehouses. To do this, the truck could be equipped with lifting rollers that keep the truck on rails. And thanks to the large coefficient of friction between rubber and steel, the Unimog U300 / U400 / U500 can move an up to one thousand tons consist with a speed of 25 km/h both forward and backward. The futuristic cabin with a really great visibility for this range has been designed by a French aircraft manufacturing company Dornier. But it produces by DuPont Company, using a light multi-layer composite fiber. Inside, there is only one joystick instead of a large number of hydraulic and equipmet controls handles. An interesting feature of the cabin is a system VarioPilot. It allows you to quickly rearrange the wheel with the pedal assembly to the passenger side and back. The chassis offers 4 installation places for equipment: top, front, rear and sides. Bodies can be mounted directly on the frame or on an interim sub-frame either, that better protects the equipment from road vibrations. There are several power take-off shafts and own hydraulic system with a pressure up to 240 bar. Wheelbase of the trucks is from 3080 to 3900 mm. The Unimog U300 / U400 / U500 are equipped with a BlueTec4 engines with 4-cylinder (4.2 liters, 156 hp) or a 6-cylinder (6.4 liter, 286 hp). Gearbox is manual with an electric-pneumatic switch Tillegent which has 8 forward gears and 6 backs. Also the trucks have all disc brakes with ABS. 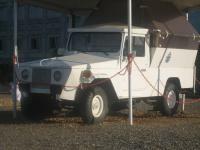 Hi I would like to revamp my 1992 Unimog 1700 Tractor. After 14 years of good service it has returned me. I've been searching for a very long time for a Magazine/catalogue for Unimogs. Something like the "Landy" for Land Rover which I'm sure you are familiar. There is a lot written on old mogs,etc in U.S.&Europe. I'm really talking the mainstream everyday working ones, i.e. 423 &427 series ones. For good used components & attachments.